I was lucky enough to attend Swedish House Mafia‘s Masquerade Motel on March 23rd at Grand Central Park Miami. While half of the population in Miami already had their hands on sold out tickets to Ultra Music Festival, I decided to check out Swedish House Mafia’s much smaller event along other DJ’s NO ID, AN21 and Alesso, needless to say, I was beyond excited. The event started off at 3pm in the afternoon, already a crowd of a couple hundred people already made it to the venue under the Miami sun while NO ID and AN21 took the stage. I made it by 4pm while Steve Angello’s brother, AN21, was at the turntables getting the crowd excited with songs like “Whisper” featuring Max Vangeli that is by far his most recognized single. In addition to “Whisper” and other songs, he also did a mix of Adele’s “Someone Like You” that had more than one singing. Moving on, after AN21, it was yet time for another Swede, Alesso. Let me just begin by saying that I’ve had “Pressure” stuck in my head for months now, and it was great to listen to it live by the DJ who created it. He mixed songs from Avicii to Coldplay and some others, captivating the crowd. Other singles that he performed where “Walking Alone” and “Raise Your Head” that had more than one singing along. He also debuted his new single “Years”, and from the response of the audience: we liked it! Calvin Harris, was up next and of course people went crazy. If you don’t know who AN21 and Alesso are, that’s fine but you MUST have heard of Mr Calvin Harris, at least once, I mean after all he’s the guy behind Rihanna’s “We Found Love” and “Feel So Close”. Most commonly known for his more pop-ish sound with house, he played fan favorite mix of “Where’s Your Head At”, a rendition of Hardwell’s “Spaceman” vs Rihanna’s “We Found Love”, as well as some less unknown songs from his repertoire: “Awooga”, “Promises” and “Bullet”. Opening the show with their latest hit, “Greyhound”, everybody hail the Swedish DJ trinity! These guys KNOW how to put a party together, their set lasted almost 2 and a half hours of back to back House heaven. Dropping tracks that people were familiar with, such as “One”, “Miami 2 Ibiza”, their mix of Coldplay’s “Every Teardrop is a Waterfall”, Third Party’s remix of Red Hot Chili Peppers “Otherside”, without missing a beat that kept the people going and having a good time. Miami, after all is the birthplace of Swedish House Mafia and of course, the Dirty South “Coming Home” remix had to be played at some point! During the show, the guys showed gratitude towards the crowd, knowing that there were many events going on in Miami during that week and that people believed in the trio and showed their support. 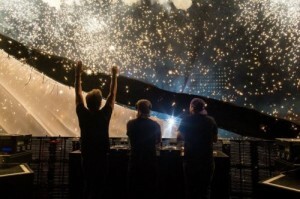 Towards the end of the show, SHM played their famous “Save The World”, and asked the audience to capture a moment on camera in which everyone sat down and jumped back up once the beat dropped. I have to admit I thought “Save The World” would be the last song of their set, but SHM had a pleasant surprise under wraps: they dropped “Leave The World Behind” last, the song that made them become Swedish House Mafia. Overall, some things that I really liked about the event was how well put it was under such short period of time. Foodtrucks were available as well as water bottle refills. It was easy for people to get around and I could finally DANCE freely without having five people pressed right next to me. All I have to say is: Swedish House Mafia, Miami loves you and we want you back here as soon as possible.